The LA MHaDDE Program consisted of a series of trainings for staff from regional centers, Department of Mental Health agencies, behavioral health agencies, school districts, physicians, psychologists, and occupational, physical and speech therapists. The program culminated in an area-wide conference. The LA MHaDDE program was overseen by a Dual Diagnosis Collaboration Task Force, which provided educational oversight, including curriculum development, training evaluation, and developing a vision of a collaborative system of referrals, and future directions for the program. To establish and maintain collaboration between agencies, clinicians, service providers and families of individuals with dual diagnosis. This project manual provides an overview of the LA MHaDDE Program, including outline of program steps used in developing and implementing the program and information about the Training Collaborative Series and Southern California Stakeholders’ Conference. 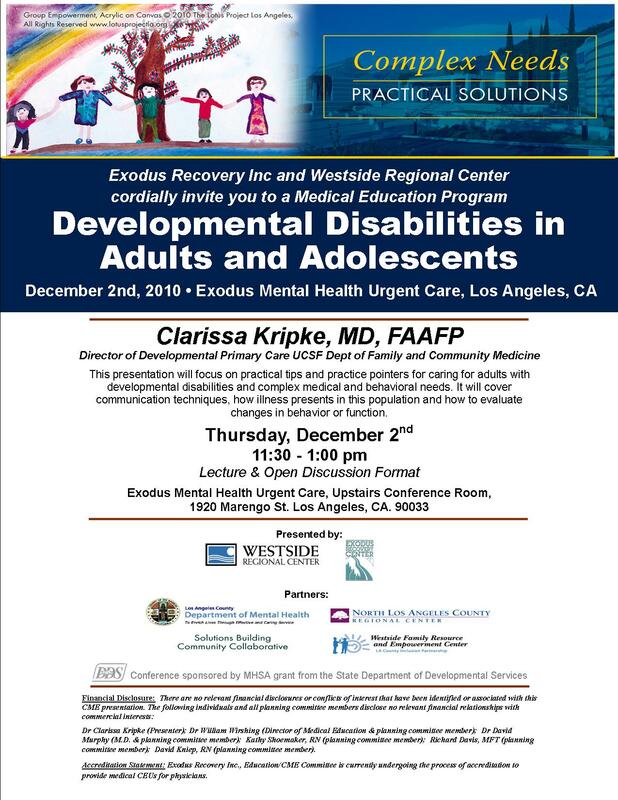 Managing Adults with Developmental Disabilities and Challenging Behaviors (Clarissa Kripke, MD). © 2019 Reach Across LA.